As today’s political climate turns increasingly hostile and the Earth’s temperature has reached record highs, the future of the global environment and the legislation surrounding it has become more important than ever. For this reason, U.S. 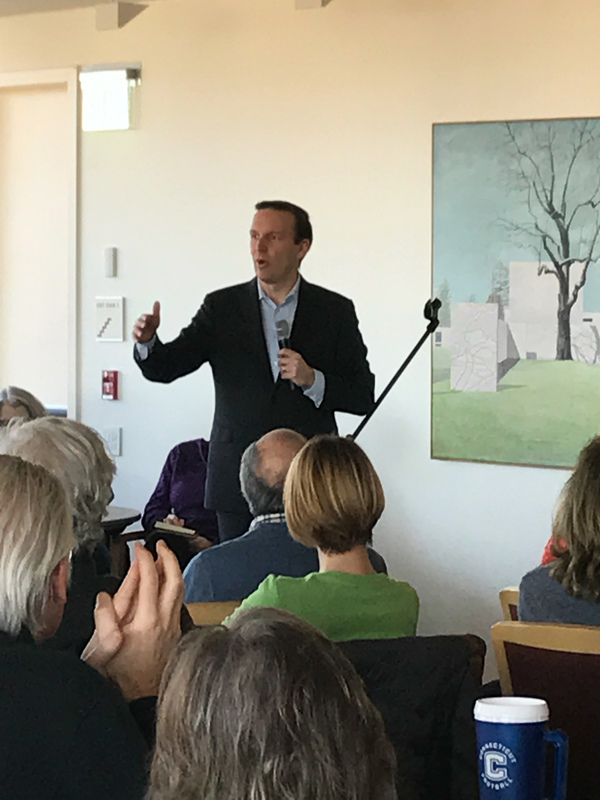 Senator from Conn. Chris Murphy hosted a meeting at the University on Saturday, Feb. 3 to discuss sustainability policy with local students, academics, and activists. 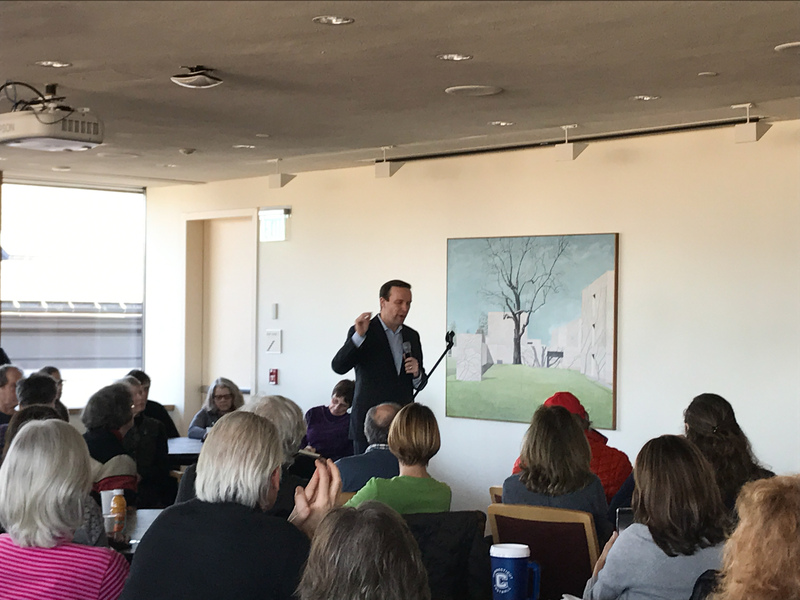 A larger-than-expected crowd gathered in the Daniel Family Commons to share their most pressing concerns with the Senator and hear what is coming out of Washington D.C. regarding pushback against the Trump Administration. Director of the Allbritton Center for the Study of Public Life and John E. Andrus Professor of Sociology Rob Rosenthal introduced Murphy. Rosenthal cited that the purpose of Murphy’s presence stems from the recent installation of an administration in which top environmental officials are also known climate change deniers. Politicians and civilians alike are exploring other angles from which to tackle issues facing the environment, more specifically maintaining compliance with the agreement reached at the Paris Climate Conference in 2015. Moving past humor, Murphy began to lay out his vision for substantive action and policy over the next four years. As many Obama-era environmental protections were passed at the very end of his term–action that Murphy lightly criticized–the GOP-majority Congress could invoke the Congressional Review Act to begin dismantling legislation passed within the last 60 days. Other major political concerns include the possibility of Trump’s walking away from the Paris Agreement and the Clean Power Plant Rule. However, his message soon turned optimistic again when discussing how to continue to fight against attempts to turn back the clock on environmental progress. Many in attendance had questions on how they could be directly involved in environmental advocacy work, despite the hostility that the current administration has toward the science of climate change. This included changing the narrative of climate change deniers, especially of those currently in office. In response, Murphy highlighted several specific steps that could be taken, encompassing the to-be-launched Citizen Toolkit to guide civic participation. Murphy also encouraged the audience to double down on investment and participation in national organizations, as they may have influence in some traditionally Republican states. This included organizations such as the Sierra Club. He also encouraged the use of social media and the wide-reaching effect that it can have on political and environmental discourse. Murphy also emphasized the power of participating in marches, such as the Women’s March. He noted the role of pure politics in environmental policy as well, particularly the Republican unwillingness to change positions on most issues even when presented with reputable scientific evidence. College of the Environment Director Barry Chernoff has noticed that the farming communities he has visited in the South and Midwest are often well-aware of climate change but vote Republican based on their economic interests. Murphy responded by acknowledging that this is, in fact, the case and that there are many other Republican constituencies in a similar position–for example, evangelicals and members of the corporate community. He notes that Democrats do need to work harder at convincing these individuals to speak up on environmental issues in meetings held by President Trump. At the end of his session, Murphy highlighted the power of young people and the change that young people can make. Mentioning the statistic that 20 percent of 20-year-olds voted while 80 percent of 80-year-olds did, he emphasized that the demographic that felt most affected about these issues was staying home. In a comment made after the meeting, he expounded his belief that youth participation plays a crucial role in advancing progressive policies. does anyone know how many jobs Sen. Murphy has brought to Connecticut? He is negative on the number of jobs. A Waterbury firm went under because they lost a Navy contract to a Mexicon subsidiary of a French firm. It’s important to know how to correctly spell and discuss something you have any opinion about. Wow- nice to hear from someone who never makes spelling errors. I never heard from a perfect person before. Have a nice day.